The sniffling. The sneezing. The aching. You know these symptoms all too well: On average, Americans come down with three colds a year. Up to 20% are unlucky enough to get the flu. But with these strategies, you can stay cold- and flu-free. People who exercise for at least 20 minutes five days a week suffer from half as many colds as those who get moving just one or two days a week. Researchers believe that exercise helps raise the number of immune cells in the body. Be conscious of how often you touch your face and try to stop doing it, says Yael Halaas, M.D., an ear, nose and throat specialist based in New York City. Flu germs enter the body through the nose, mouth and eyes, so even a quick three-second eye rub could lead to a week of sniffling and coughing. 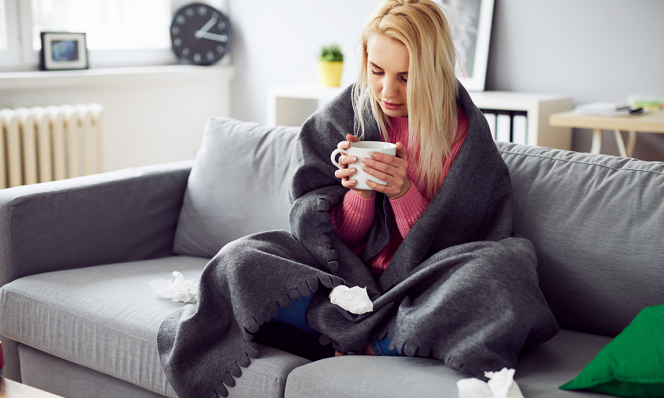 A diet low in refined sugar strengthens the immune system and can potentially protect the body against cold and flu, says Alan Gaby, M.D., who specializes in nutritional medicine. "Although there&apos;s no research that clearly proves sugar causes more illness, some doctors have observed that people who reduce sugar consumption have fewer infections and are generally healthier overall," he says. Skimp on slumber and you're three times more likely to catch a cold, according to a Carnegie Mellon University study. Aim for at least seven hours a night. If you're traveling by plane, train or bus for the holidays, pack some antiseptic wipes in your carry-on. "Clean your seat and armrests before you settle in," suggests Halaas. The single most important preventive measure you can take is to wash your hands, and often. But don't lather up with hot water. A lukewarm rinse works just as well for killing bacteria. In fact, an uncomfortably warm wash dries the skin, which could cause it to crack, leaving you susceptible to other infections. Fresh fruits, veggies, lean meats and fish will do a body good year-round, but adding certain foods to your diet will give your body's infection-defeating abilities an extra boost, says Bonnie Taub-Dix, R.D., a member of the Family Circle Health Advisory Board. Try some—or all—of these. Carrots: A diet rich in beta-carotene—also found in bell peppers, kale, broccoli, sweet potatoes and squash—protects the lining of the nose, which traps germs before they can infect you. Green Tea: Science backs up what tea drinkers have known for centuries: Going green keeps you healthy. In a study at the University of Florida, people who consumed two cups of green tea daily for three months had 32% fewer colds than those who didn't imbibe. "If you aren't crazy about the flavor, add a splash of 100% fruit juice," suggests Taub-Dix. Nonfat Greek Yogurt: This rich and tangy variety has three times more protein (which helps increase the number of immune cells in your body) than regular yogurt. It's also chock-full of immune-boosting live and active cultures. Salmon: No doubt you've heard this food is a great source of heart-strengthening omega-3 fatty acids, but one serving also contains up to 1,000 IU of vitamin D; a University of Colorado, Denver, study found that upping your intake of the vitamin staves off colds. Garlic: A compound called allicin fights against bacterial, viral and fungal infections, says Taub-Dix. Plus, in a recent study, people who took a daily garlic supplement had 36% fewer colds over the course of a year than those who were given a placebo. The best way to ensure you and your family a flu-free season is with a vaccination. Yet in 2010 less than half of American adults were vaccinated, says Susan Rehm, M.D., medical director of the National Foundation for Infectious Diseases. Her patients typically offer one of these rationales. Here's what she says. 1. "I'll get the flu from the vaccine." "This is literally impossible," says Rehm. When people say they're experiencing symptoms after being vaccinated, they usually don't have the flu, but another virus that also causes fever, chills, body aches and fatigue. In the rare instance that they actually come down with the flu, it's because they were exposed to the illness before receiving the shot. The short answer: coincidence. 2. "What's the big deal if I get the flu? It's annoying but harmless." Each year more than 200,000 Americans are hospitalized due to respiratory and heart complications associated with influenza. "Even when you have a less severe case, it still disrupts your life and puts other people around you in danger, especially kids and the elderly," says Rehm. 3. "The shot only works in the fall." The sooner you get vaccinated, the better. But if you wait until January or February, it will still protect you for the rest of the flu season, which can last through March. Go to flu.gov/whereyoulive to find a flu vaccine provider near you. Scientists have run several studies on vitamin C only to find that it does nothing to keep you from getting sick. But that doesn't mean you should stop drinking orange juice and toss your supplements. If you take a large dose of vitamin C at the first sniffle, you can reduce the severity and duration of your cold. Another Option Ask about the nasal-spray seasonal flu vaccine, called FluMist. It's approved for use in healthy people between the ages of 2 and 49.